The William Penn statue, atop City Hall Tower, Philadelphia. To get a better view of the magnificence of the sculpture, just click directly on the photo to enlarge it. The William Penn Statue, atop Philadelphia City Hall Tower, is the largest statue, on any building in the entire world. And you can get a breathtaking view of Philadelphia, just by standing in the brim of his gigantic hat. Here are some more interesting facts and observations, about this incredible bronze sculpture, which you can visit by riding the elevator to the top of Philadelphia City Hall Tower. 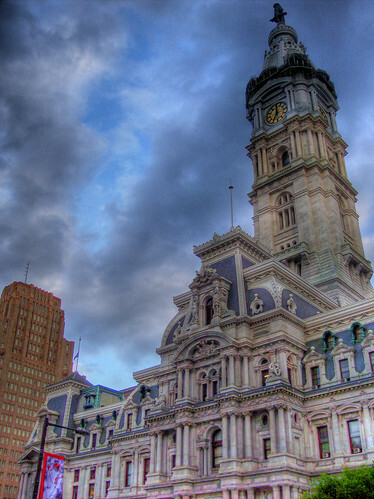 Philadelphia City Hall Tower, along with Penn, is 511 feet tall. The statue weighs over 53,000 pounds (over 26 tons), and stands over 37 feet high. In 1893, a Philadelphia Chamber of Commerce book titled The City of Philadelphia As It Appears in 1893, wrote some extended observations, on the William Penn Statue. City Hall would not be completed until 1901, eight years after the book's publication, and 30 years after construction had begun. If you'd like to leave the William Penn Statue and return to Philadelphia City Hall, please click here.